This year, there are many festivities celebrating the legacy of the Protestant Reformation – 500 years after Martin Luther penned his Ninety-five Theses in 1517. However, one of the most important legacies which has been overlooked is the Counter-Reformation – the Catholic revival which responded to the protests of Luther and other reformers. When we consider a country like China – or most other places outside of Europe at the time – it is in fact the Counter-Reformation that had an arguably more important impact (at least initially). Three examples, I believe, are worth highlighting, as they show just how much Protestantism in China is indebted to Catholicism in China and, by extension, the Counter-Reformation. 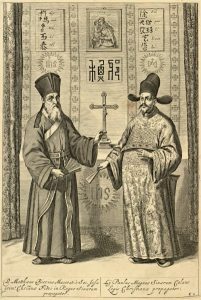 Histories of Christianity in China often start with a short section on the ‘early missions’ of the Church of the East1 entering during the Tang dynasty and the Franciscans entering during the Yuan dynasty. These two missions, however, did not seem to have much success and, in many histories, are therefore quickly skimmed over. The real success was initiated by the Jesuit missions and its most famous missionary Matteo Ricci entering in the 16th century. Now if we pause for a moment, we must remember that this is the same 16th century when Martin Luther penned his infamous Ninety-five Theses. Where were the Protestant missions at this time? Now, Protestants in the 16th century were indeed focused on evangelism. But it was mostly focused on the evangelism of Christian lands, to spread the ‘correct’ Christian faith. Through the Counter-Reformation, a revival in Catholic evangelistic fervour was seen through the establishment of new religious orders such as the Society of Jesus (a.k.a. the Jesuits). As a significant legacy of the Protestant Reformation, religious orders like the Jesuits would be pioneering missions to Japan, China, India, as well as the Americas. When Protestant missionaries finally arrived in China in the 19th and 20th centuries, they would debate over different missionary strategies and over how to best convey certain theological terms. Inevitably, they would refer to the Jesuits and the work of key figures like Matteo Ricci in making their various arguments. Although I have not seen the Basset translation myself, I have seen a copy of the Morisson Bible in the New College Library in the University of Edinburgh. I was struck by the fact that the Gospel of Matthew was translated not as Matai 馬太 (as it is commonly found in Protestant translations of the Bible), but as Madou 瑪竇 – as in, Li Madou 利瑪竇, the Chinese name for Matteo Ricci. My last point is one that has been at the centre of much of my recent research: public theology – that is, the Chinese Christian engagement with the public space, often involving matters of politics and the civil society. My next book deals with the topic of Chinese public theology, with a particular focus on what has developed since the 1980s.4 However, I have a chapter that deals with many of the earliest forms of public theology, such as that coming from the ‘four pillars’ of the Catholic church – the most famous first converts of the Jesuit missions: Xu Guangqi, Li Zhizao, Yang Tingyun, and Wang Zheng. All four were intellectual elites, passing the highest level of the imperial civil service exams, and serving in the imperial bureaucracy. Significantly, they were also all part of the Donglin movement – a reformist group which sought to critique corrupt government officials, including the emperor. However, these pillars were not only interested in political and moral reform, but they also had a strong spirit of social concern, creating benevolent societies 仁會 – an early form of a civil society. Interestingly, these benevolent societies brought together Confucian moral teachings with Medieval Catholic moral teachings – such as the Seven Corporal Works of Charity that was taught by the Jesuits. Overall, what we see in these three examples – missions, the Bible, and public theology – are three significant aspects of the legacy of the (Counter) Reformation in China. Moreover, they are a legacy which firstly shaped the course of Catholicism in China, before having later reverberations in Protestantism in China as well. This entry was tagged Bible, Catholicism, China, Counter-Reformation, Matteo Ricci, Missions, Missions to China, Protestant Reformation, Protestantism, Public Theology, Robert Morisson by Alexander Chow. Bookmark the permalink.